I Make Cheese: Beehive Cheese Co. I've been ashamedly behind in my cheese making recently, so I'm doing penance by supporting other small-batch artisanal cheese makers instead. 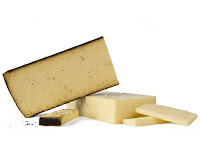 Woot's "Wine Woot-Off" just offered two of Beehive Cheese Company's cheeses, "Barely Buzzed" and "Seahive." Never heard of 'em before, but that's one of the reasons why I love woot. I ordered up a pound of each and am looking forward to sharing with friends over the Holidays! What's the environmental impact of cheese?